APHA, 1998. American Public Health Association. Standard Methods for the Examination of Water and Wastewater, 20th Edition, Washington, D.C., USA, 1325 pages. Ahlgren, M. O., Bowen, S. H. 1992. Comparison of Quantitative Light Microscopy Techniques Used in Diet Studies of Detritus-consuming Omnivores, Hydrobiologia 239:79–83. Altınayar, G. 1988. Su Yabancı Otları, DSİ Genel Müdürlüğü Yayınları, Ankara, 237 pages. Atasagun, S., Karabatak, M. 1995. Mogan (Ankara) Gölü’ndeki Sazan (Cyprinus carpio) ve Kadife (Tinca tinca) Balıklarının Beslenmelerindeki Mevsimsel Değişimler, S. D. Ü. Eğirdir Su Ürünleri Fakültesi Dergisi 4: 151-167. Balık, İ., Belgin, K., Özkök, R., Çubuk, H., Uysal, R. 2003. 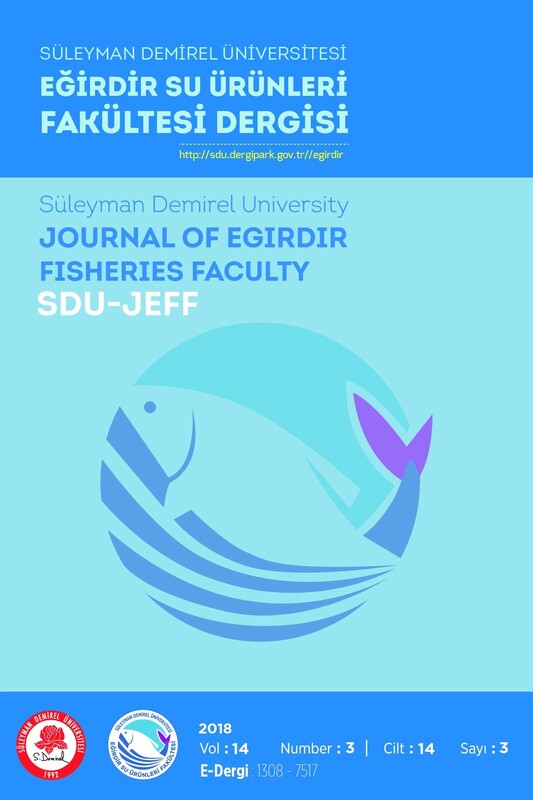 Diet of Silver Crucian Carp Carasssius gibelio in Lake Eğirdir, Turkish Journal of Fisheries and Aquatic Sciences, 3: 87-91. Benzer, S. Ş., Gül, A., Yılmaz, M. 2007. The Feeding Biology of Tinca tinca L., 1758 Living in Hirfanlı Dam Lake. C.Ü. Fen-Edebiyat Fakültesi Fen Bilimleri Dergisi 28:40-50. Bergman, E., Greenberg, L. A. 1994. Competition between a Planktivore, a Benthivore, and a Species with Ontogenetic Diet Shifts, Ecology, 75:1233-1245. Bowen, S. H., 1982. Feeding, Digestion and Growth: Qualitative Considerations, In: The Biology of Culture of Tilapias. R. S. V. Pullin and R. H. Lowe-McConnell (Eds. ), ICLARM Conference Proceedings, Manila, Philippines. Volume 7, pp. 141-156. Calow, R., 1985. Adaptive Aspects of Energy Allocation, In: Fish Energetics: New Perspectives. P. Tytler and P. Calow (Eds. ), Helm, Backenham, UK, pp. 13–31. Crivelli, A. J. 1981. The Biology of the Common Carp in the Camargue, Southern France, Journal of Fish Biology, 18:271-290. Conover, R. J. 1966. Assimilation of Organic Matter by Zooplankton, Limnology and Oceanography, 11:338-345. Çetinkaya, O., 1992. Akşehir Gölü Sazan (Cyprinus carpio L., 1758) Populasyonu Üzerinde Araştırmalar II. Popülasyon Yapısı, Üreme ve Beslenmesi, Doğa Turkish Journal of Zoology, 16:30-42. Demirsoy, A., 1990. Entomoloji (Yaşamın Temel Kuralları), Cilt: 2. Kısım: 2. Meteksan Yayınları, Ankara, 890 s.
Demirsoy, A., 1999. Omurgasızlar (Yaşamın Temel Kuralları), Cilt: 2. Kısım:1 Meteksan Yayınları, Ankara, 1210 s.
Dewan, S., Miah, J. U., Sarker, A. L., Saha, S. N. 1979. Seasonal Patterns of Feeding of Juvenile Major Rohu Carp, Labeo rohita (Ham.) in a Bangladesh Pond Journal of Fish Biology, 14 (6): 511–515. Eder, S., Carlson, C. A., 1977. Food Habits of Carp and White Suckers in the South Platte and St. Vrain Rivers and Goosequill Pond, Weld County, Colorado. Transactions of the American Fisheries Society, 106:339- 349. Garcia, L. M., Adelman, I. R., 1985. An in Situ Estimate of Daily Food Consumption and Alimentary Canal Evacuation Rates of Common Carp, Cyprinus carpio L. Journal Fish Biology, 27: 487-493. Getachew, T., 1987. A Study on an Herbivorous Fish, Oreochromis niloticus, Diet and its Quality in Two Ethiopian Rift Valley lakes, Awasa and Zwai, Journal of Fish Biology, 30: 439-449. Getachew, T. 1988. Digestive Efficiency and Nutrient Composition Gradient in the Gut of Oreochromis niloticus L. in Lake Awasa, Ethiopia, Journal of Fish Biology, 33(4): 501-509. Hofer, R., Schiemer, F., 1983. Feeding Ecology, Assimilation Efficiencies and Energetics of Two Herbivorous Fish: Tilapia mossambicus and Puntius filamentosus. In: Limnology of Parakrama Samudra-Sri Lanka, A case study of an ancient man-made lake in the trophics. Schiemer F. (Ed. ), W. Junk Publishers, The Hague, pp.155-164. Lasenby, D. C., Langford, R. R., 1973. Feeding and Assimilation of Mysis relicta. Limnology and Oceanography, 18(2): 280-285. Larson, E. T., Shanks, A. L., 1996. Consumption of Marine Snow by Two Species of Juvenile Mullet and its Contribution to Their Growth. Marine Ecology Progress Series, 130: 19-28. Lund, H. C., Lund, J. W. G., 1995. Freshwater Algae: Their Microscopic World Explored, Bio. Press. Publication, Bristol, UK., 360 pages. Montgomery, W. L., Gerking, S. D., 1980. Marine Macroalgae as Foods for Fishes: an Evaluation of Potential Food Quality, Environmental Biology of Fishes, 5:143-153. Panek, F. M., 1987. Biology and Ecology of Carp. In: Carp in North America. E. L. Cooper (Ed. ), Bethesda, Md., American Fisheries Society, pp. 1-15. Penttinen, O. P., Holopainen, I. J,. 1992. Seasonal Feeding Activity and Ontogenetic Dietary Shifts in Crucian Carp, Carassius carassius, In: Environmental Biology of European Cyprinids. W. Wieser, F. Schiemer, A. Goldschmidt, K. Kotrschal (Eds. ), Department of Biology, University of Joensuu, Finland, 33: 215- 221. Petridis D., 1990. The Influence of Grass Carp on Habitat Structure and its Subsequent Effect on the Diet of Tench. Journal of Fish Biology, 36: 533-544. Prejs, A., Blaszczyk, M. 1977. Relationships between food and cellulase activity in freshwater fishes. Journal of Fish Biology, 11: 447-452. Polis, G. A., Strong, D. R. 1996. Food Web Complexity and Community Dynamics, The American Naturalist, 147: 813–846. Summerfelt, R. C., Mauck, P. E., Mensinger, G. 1970. Food Habits of the Carp (Cyprinus carpio L.) in Five Oklahoma Reservoirs, Proceedings of the Southeastern Association of Game and Fish Commissioners, 24: 352- 377. Tande, K. S., 1985. Assimilation Efficiency in Herbivorous Aquatic Organisms-The Potential of the Ratio Method Using l4C and Biogenic Silica as Markers, Limnology and Oceanography, 30: 1093-1099. Wootton, R. J., 1990. Ecology of Teleost Fishes. Fish and Fisheries Series 1. Chapman and Hall Publication. London, UK., 404 pages. Yılmaz, M., Yılmaz , S., Bostancı, D., Polat, N., Yazıcıoğlu, O. 2007. Bafra Balık Göllerinde Yaşayan Havuz Balığı (Carassius gibelio Bloch, 1782) nin Beslenme Rejimi, Journal of FisheriesSciences.com 1: 48-57. Zhuang, S., 2006. The Influence of Salinity, Diurnal Rhythm and Daylength on Feeding Behavior in Meretrix meretrix Linnaeus, Aquaculture, 252: 584– 590. ISNAD TURKER, Hakan . "Gölköy Gölü’nde (Bolu-Türkiye) Yaşayan Üç Sazangil Türünün Beslenme Alışkanlıkları ve Asimilasyon Etkinlikleri". Süleyman Demirel Üniversitesi Eğirdir Su Ürünleri Fakültesi Dergisi 2 / 1 (January 2006): -.